As medical students, residents and physicians we are always told to put our patients first. In medical school, we sacrifice sleep and social activities to study to ensure that we will have the tools to properly serve future patients. Once we become residents, we work as hard as possible to be there for patients and this continues on throughout our careers as physicians. Unfortunately, oftentimes, this means that we forget to take care of ourselves. For this reason, we see high rates of burnout in the medical community. In fact, the Canadian Medical Association National Physician Health Survey conducted in 2017 found that of the 3000 Canadian residents and physicians who responded, 30% reported burnout, 34% experienced symptoms of depression, and 8% had had suicidal ideations within the last 12 months. These issues are discussed at length in a recent position paper by the CFMS responding to medical student suicide. These statistics highlight just how important it is to promote wellness as early as possible. If we can come up with tools to be well as medical students, we can hopefully use those tools as we progress in our careers as physicians. At Queen’s we are lucky enough to have a wellness curriculum, where we can discuss issues affecting the undergraduate classes and learn strategies to cope with wellness issues. We also have a wellness committee that strives to provide opportunities for student wellness through different events. Wellness within the medical school becomes a priority during our annual Wellness Month, which runs in conjunction with the CFMS National Wellness Challenge. This year, wellness month runs from January 14 – February 10. You can participate as an individual or in teams of 3-5. Each week will focus on a different area of wellness. We kick off the month with Social Wellness week, followed by Physical Wellness, Mental Wellness and Nutritional Wellness. Each week, participants can follow national challenges set by the CFMS and track their points through the scoresheet provided upon registration. 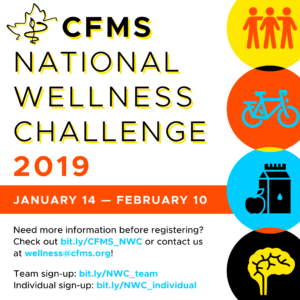 To register for the CFMS national wellness challenge, please follow the links below (Team sign up: bit.ly/NWC_team; Individual sign up: bit.ly/NWC_individual). 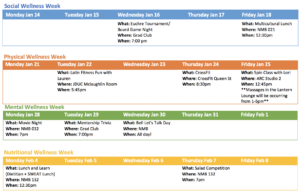 At the same time, we encourage students, residents and faculty to attend our Queen’s specific events. Some of the events we are running this year include a Multicultural Potluck Lunch, Zumba/Crossfit/Spin classes, a Movie Night, Lunch and Learn with a Dietitian and many more! The schedule of events can be found within this post. In addition, all of the information regarding Wellness Month can be found at our Facebook page: 2019 Wellness Challenge – Queens (https://www.facebook.com/groups/2019NWCQueens/). This year, we would love to see participation from as many students, residents and faculty as possible! All events are open to anyone who would like to attend, though some require you to sign up in advance. If you have any questions or concerns regarding wellness month, please e-mail me at wellness@qmed.ca. Let’s come together, promote our wellness and have fun as we do it!